1 yard for the backing (it will have to be pieced) or if you want it whole then use 1.5 yards. Select 2 coordinating prints to make each snowball block, make sure one is dark and one is light to create enough contrast, and that you have 2 charm squares of each print. 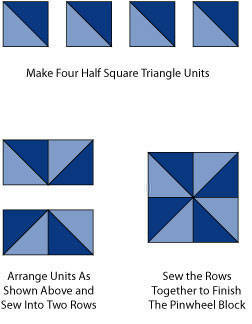 Halve each charm square (5"x5") diagonally - thus you will obtain 4 half square triangle blocks from each two same print charm square blocks. Cut 40 3"x3" square blocks from the white background fabric for the snowball corners. Assemble pairs of snowball blocks by joining them to a 9" x 1.5" strip segment, and then also add a 9" strip segment to the exposed parallel edges. (See finished runner above). Then join the pairs of snowball blocks to each other with the 21.5"x1.5" strip segments, also add a 21.5"x1.5" segment to the top and bottom of the snowballs on the edges. Cut 3 x 2.5" border strips from the coordinating print across the width of the fabric. 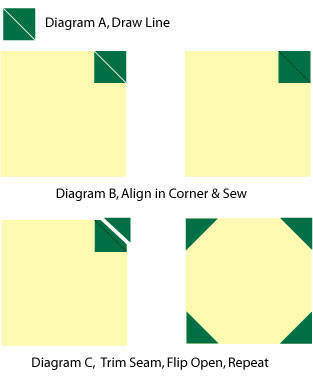 Cut one of the 2.5" strips into 2 x 21.5" segments and use the remaining fabric to lengthen the other segments so that you will obtain 2 x 48.5"x2.5" strips for the borders on the long sides. Attach the short (21.5"x2.5") border strips to the centre panel first, and then the long (48.5"x2.5") border strips to the length. You will need about half a yard of fabric for the binding and at least 1 yard for the backing. The amount of batting will depend on the batting width. Finished size of the runner should be about 25" x 48". What a gorgeous and joyful Christmas table runner. I love the fabrics. Thanks so much for the tutorial. Great use of a charm pack (I never know what to do with them). Those pinwheel snowballs are brilliant! Just like a peppermint. You are really on the ball for Christmas! Great runner. I love your tablerunner .. thanks for the tutorial. I love this and those fabrics are to die for. :D Thank you so much for sharing the tutorial with us.